The perfect way to support your team – NOISILY !!! A Promotional Cheering Air Balloon Stick also called Thunder or Bang Bang Stick. 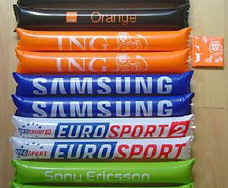 Inflatable sound generating sticks, bang them together and cheer for your team, fantastic sports & promotional item. Very popular worldwide, creating a new cheering culture in various sports / festivals activities. Insert a straw to blow the air. Take the straw out of it after inflating it will be automatically shut off. It is re-usable. After use, insert the straw deeply to deflate it. A very visual and cost-effective Promotional Product. and are ideal as a fund raiser for your club, school or organization.